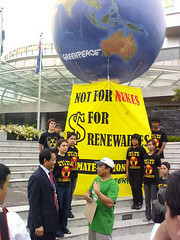 Tara delivers our message to the Thail delegate: "Nuclear power is bad for Southeast Asia's future!" This is in response to the front-page article titled “Nuke energy key to stem climate change” (3/2/09), which is about the nuclear industry’s claim that nuclear power has a role in climate change mitigation. Nuclear power in fact undermines climate protection and can only make a negligible contribution to carbon dioxide (CO2) reduction.